(Newser) – Gun-control advocates are facing a very modern problem: Anyone with a computer and a 3D printer—which use plastic instead of ink—could theoretically become a gun maker. Websites offer blueprints that users can download; within hours, they'll have brand-new rifle parts or ammunition magazines, the Washington Post reports. And the fact that they could skirt any new regulations with ease is a "nightmare" for the politicians pushing for new restrictions, says a pro-gun lobbyist. When they outlaw printers, only outlaws will have printers. When I was 14 years old.. I made a 410, center fire, Single shot, Blunder bust Pistol.. Kicked like heck.. Could have really used a 3d printed handle. I come from a machinist family.. No one in my family are gun smiths. Yes you can do this.. Maybe Not the barrel.. But that could be made form steel with a Hand Held Electric drill. Most of the other parts could have been made on a printer. The size and thickness of some parts would need to be modified for the strength difference. 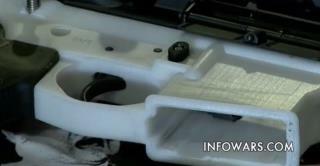 You can "print" the parts, but the plastics used in gun making are not used in a 3D printer. They are used for prototyping. to make sure the parts fit. Then they go to a machine shop for manufacture or injection molding. You wont be "printing" the carbon fiber parts needed for a gun.